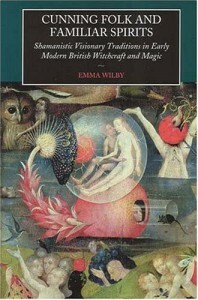 Emma Wilby’s Cunning Folk and Familiar Spirits: Shamanistic Visionary Traditions in Early Modern British Witchcraft and Magic is an exploration of European, and especially British, shamanism in the early modern period. Many people who are interested in shamanism seem to think that “European shamanism” is an oxymoron – that shamanism has seldom ever been practiced in recent history, and then by only a few scattered bands in the remotest (relative to Europe) parts of the world. Wilby carefully dismantles this assumption, and shows how shamanism was a pervasive phenomenon in Europe down to just a few centuries ago. As she does this, she dismantles another unwarranted but often-stated assumption: that the Witch Trials of the sixteenth and seventeenth centuries were examples of mass hysteria, that the accusations of witchcraft were purely fabrications by the ecclesiastical and secular authorities, and that there wasn’t actually any witchcraft going on. Wilby shows that there was a true experiential and folkloric basis behind the deeds recounted in records of the Witch Trials; some form of magic or witchcraft was indeed being practiced, even though the elite may have understood it differently than the peasants who practiced it did. Specifically, what the Church and the government interpreted in terms of Christianity was actually a remnant of something far older. Wilby uses cross-cultural parallels with shamanistic traditions in Native North America and Siberia to show that British witchcraft, as it was described in the court documents of the Witch Trials, had all of the hallmarks of shamanism. Additionally, she compares descriptions of the “demons” with whom the witches worked to folkloric portrayals of fairies, and makes a very convincing case that the “demons” of the court documents were understood to be fairy familiars by the witches themselves. The last section of the the book, “The Experiential Dimension,” is especially bold. Here, Wilby attempts to get the reader to understand what life was like for the British peasantry during this period, and how those circumstances and ways of life would have been especially conducive to encounters with phenomena that were believed to be spirits, as well as a belief in the efficacy of magic. This adds a very human, sensitive, and sympathetic element to her discussion of beliefs and practices that most modern people find to be simply absurd and inexplicable. If you have any interest in European shamanism and are looking for a book on the topic that’s both scholarly and a joy to read, Cunning Folk and Familiar Spirits is indispensable. Highly recommended. Click here to view or buy Cunning Folk and Familiar Spirits at Amazon.com.